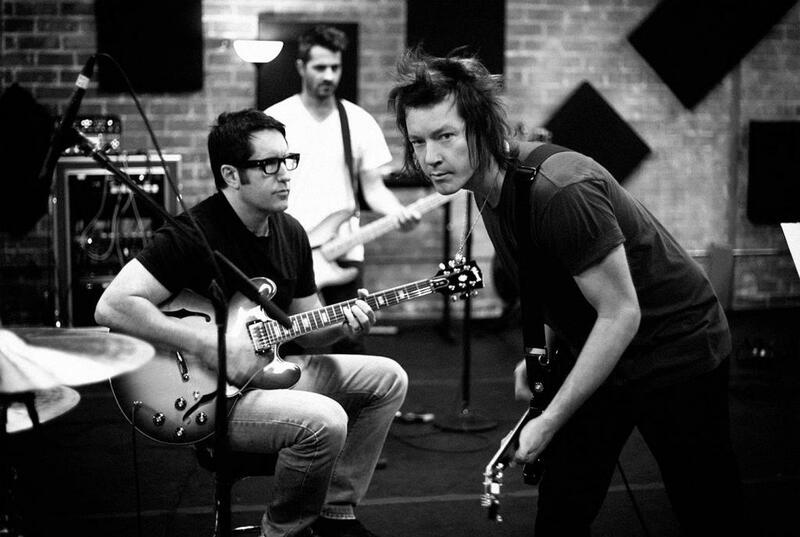 Robert John "Robin" Finck (born November 7, 1971) is an American guitarist. He is one of only a few artists who has played in two different bands listed on VH1's "100 Greatest Artists of Hard Rock": Nine Inch Nails (ranked no. 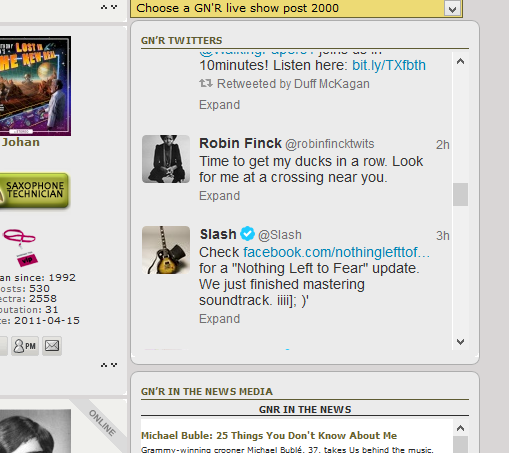 43]) and Guns N' Roses (ranked no. 9). Finck grew up in Marietta, Georgia and played with several unsigned bands based primarily in the Atlanta area, including acts such as Prowess, Bat Your Lashes, Sik Dik (bandmates of which included Steve "Holiday" Childress and Michael Allen, currently of The Goodies and Greg Thum), and Impotent Sea Snakes. He joined Nine Inch Nails as part of their touring band in 1994–95 for their Self-Destruct and Further Down the Spiral tours following the departure of previous guitarist Richard Patrick. Finck appeared with Nine Inch Nails at Woodstock '94, and saw his first official release with them, the Closure video, released in 1997. Once the tour was completed, he took a job playing for the circus troupe Cirque du Soleil in the original tour of Quidam. In 1997 Finck signed a two-year contract with Guns N' Roses as the replacement for Slash (who had quit the band at the end of the previous year) and began work on what was ultimately to become the band's long delayed album Chinese Democracy. When the two years were up the album had not been completed, although the song Oh My God was released on the End of Days soundtrack. Whether or not Finck played on the song is in dispute; GNR vocalist Axl Rose says he did while Finck himself says he did not. Finck rejoined Nine Inch Nails as the band embarked on their Fragility v1.0 and Fragility v2.0 tours in support of the 1999 album The Fragile. These tours were recorded and released as the live album/DVD, And All That Could Have Been, which marked Finck's second release with them. He also played on a studio-recorded version of The Day The World Went Away on the companion album Still, which was included with the deluxe version of And All That Could Have Been and later made available as a standalone CD through nin.com. Shortly after the tour ended in 2000 he returned to Guns N' Roses, playing four shows with them in late 2001 followed by a brief tour of Europe and Asia in mid-2002 and a live appearance at the MTV Video Music Awards. A planned US tour was meant to continue through the remainder of 2002 but was called off by the promoter after two cancelled shows led to rioting by fans. Around this time Finck and then-bandmate Buckethead contributed to the soundtrack of the John Carpenter movie Ghosts of Mars, playing alongside members of thrash metal group Anthrax and guitar virtuoso Steve Vai. After his touring obligations with GNR were fulfilled he joined the LedZAriel production (a performance by acrobats set to the music of the band Led Zeppelin). Finck was invited to rejoin NIN to tour in support of their 2005 album With Teeth but chose not to and the position was filled by Aaron North. In the summer of 2006, he toured Europe with Guns N' Roses playing in front of over 700,000 people. They finished up by touring North America for the remainder of the year, and went to Mexico, Australia and Japan in 2007. On April 4, 2008, it was announced via nin.com that Finck would be rejoining Nine Inch Nails as a member of the live band. He subsequently contributed to the Nine Inch Nails album The Slip, earning a performance credit alongside then-band members Josh Freese and Alessandro Cortini. In November 2008 Guns N' Roses' long awaited album Chinese Democracy was released. Finck has a co-writing credit on the song "Better", which was later released as a single. He also played guitar on every track, performed 7 of the guitar solos and has additional credits for keyboards, arrangements and pre-production. He chose to remain with NIN after the album's release and, as of March 21, 2009, has been replaced as the lead guitarist of Guns N' Roses by DJ Ashba. The official Guns N' Roses website states that "Robin continues to be part of GN'R, by virtue of Guns' history and his involvement in Chinese Democracy". Following the departure of NIN live band members Alessandro Cortini and Josh Freese at the end of 2008 Finck and bassist Justin Meldal-Johnson re-grouped with band leader Trent Reznor and new drummer Ilan Rubin and the 4-piece band completed an 8-date tour of Australia and New Zealand between February and March 2009. Finck continued to perform with the band throughout the 2009 Nine Inch Nails/Janes Addiction (NIN|JA) tour, with shows throughout North America, and the subsequent Wave Goodbye tour through Europe and Asia. The band then returned to the US to play a series of shows culminating in the final live appearance of Nine Inch Nails. 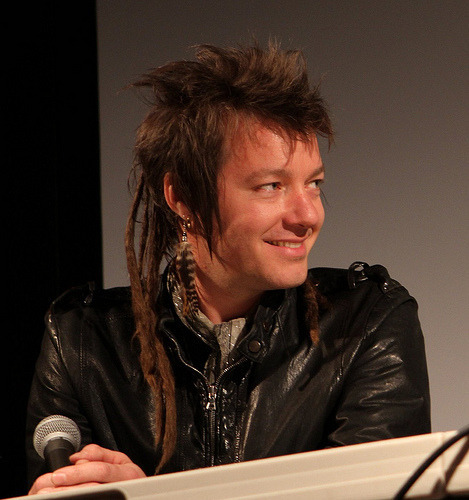 In October 2009 Finck and former Guns N' Roses bandmates Axl Rose, Tommy Stinson and Buckethead were named in a lawsuit by electronic musician Ulrich Schnauss's record labels Independiente and Domino alleging that they had committed copyright infringement by using portions of his compositions in the song "Riad 'n the Bedouins". Finck appears on the 2010 album The Lady Killer by artist Cee-Lo Green, performing guitar on the track "The Lady Killer Theme (Outro)". On March 12, 2012, Finck appeared on-stage with Guns N' Roses, performing "Better", a song he co-wrote with Axl Rose. Well, when I was first playing with Robin, I was new in the band and I think it’s the kind of thing, it’s like, I got the feeling it was almost like mom just got home from the hospital with the newborn. It’s like, “Here’s your new brother, play nice. The kid is like, “Who’s this?” Just the skepticism and the doubt and the whole, “I’m the son, not you,” kind of, just all the things that come along with that situation, where suddenly someone else is thrown into your world. It’s like, “Wait a minute. Don’t I have a say in this? This is my family, too,” kind of vibe, just the little elements of that. So it was really rocky at first and for a long time. So, I think that me and Robin, probably after he left the band, we became better friends. When he was playing with Nine Inch Nails and I would go to see him with that and we’d hang out after the show, and I think we became closer after we stopped playing together because of the way we were thrown together. Because, at the time, they were auditioning people for months and they were so burnt out. The tour was a few weeks away. They thought that, “All right, we’re not getting the third guitarist like Axl wants,” which was always his vision. He always wanted a three-guitarist band. He loves Boston. He loves a lot of the old classic stuff. He’s just a guitar lover. Apparently, Robin is back in NIN. The first in about two years.... Anyone knows what he is talking about?